Elegant glass teapots are preferred for herbal infusions. 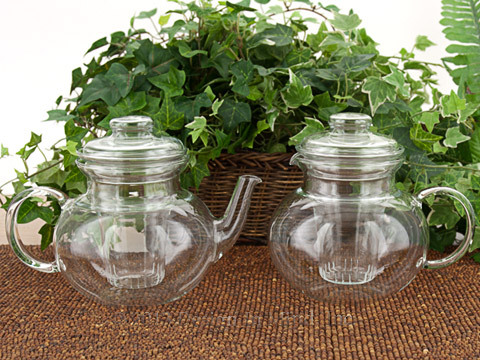 Glass teapots are preferred for green and white teas, and also for herbal infusions. 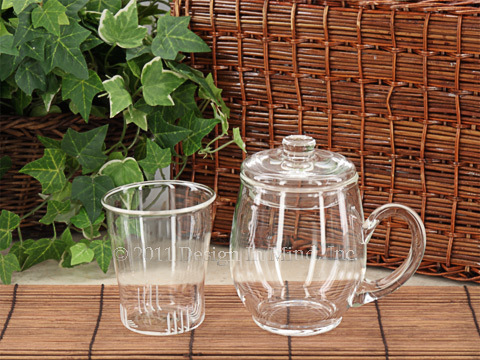 The clear glass teapot allows you to fully appreciate the color of the tea. Glass will not change the flavor of even the most delicate teas, and will not absorb tea flavors or oils. 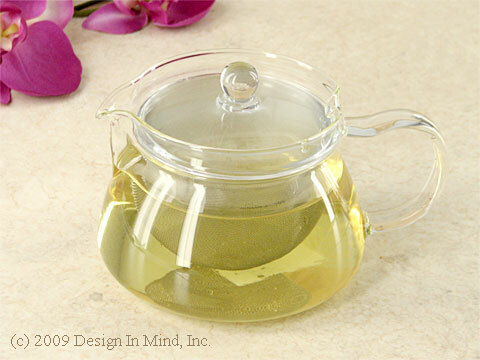 Borosilicate glass teapots can be directly heated on gas or electric (but NOT induction) cooktops. Replacement glass infusers for Simax (Kavalierglass) teapots. TP1011 fits the Marta and Helena teapots. 4 1/4" top edge diam. x 4 1/4" high from base to bottom of top lip. Requires 3 1/2" diameter minimum opening. 4 3/4" overall height. TP1013 fits the Nostalgia and Eva teapots. 3 3/4" top edge diam. x 4 1/4" high from base to bottom of top lip. Requires 2 7/8" diameter minimum opening. 4 3/4" overall height. Made in the Czech Republic. Japanese glass tea pot 18 oz. 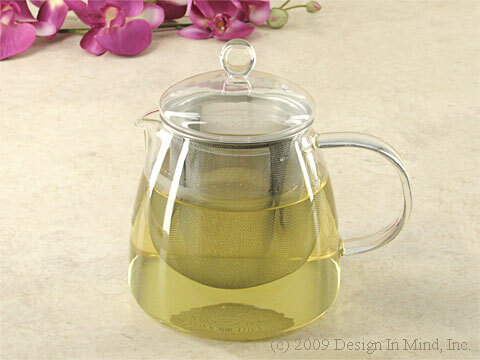 18 oz glass tea pot for hot or iced tea by Hario. Glass pot with glass lid. Includes a large deep removable stainless steel mesh infuser basket. 4.5" base dia. x 4"h. Made in Japan. Japanese glass tea pot 24 oz. 24 oz glass tea pot for hot or iced tea by Hario. Glass pot with glass lid. Includes a large deep removable stainless steel mesh infuser basket. 4.75" base dia. x 6"h. Made in Japan. Simple 33 oz. glass teapot. 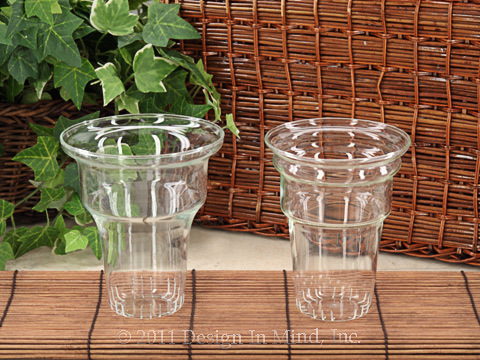 Borosilicate glass can be used directly on gas or electric ranges, and is dishwasher safe. Preferred for herbal infusions. Includes a glass infuser. Made in the Czech Republic. We recommend a large Tea Quilt tea cozy for use with either teapot. Available with traditional spout or in simpler jug style. 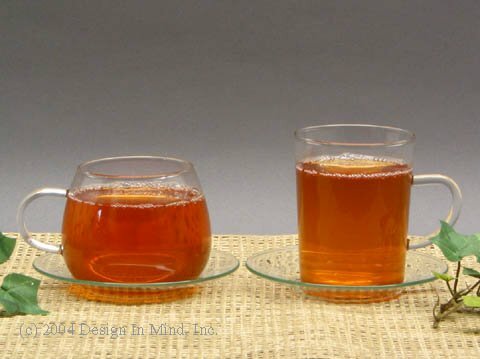 Beautiful glass cups and glass saucers (six cups/saucers per set) allow your guests to fully appreciate the color as well as the taste of good tea. Available in teardrop (left) 8 oz. cup or tall (right) cylindrical 6 oz. cup. Borosilicate glass is dishwasher safe. Made in the Czech Republic. Glass brew in mug set - 12 oz. 12 ounce glass mug set includes glass mug, infuser, and lid. Lid can also be used as a coaster for the infuser. 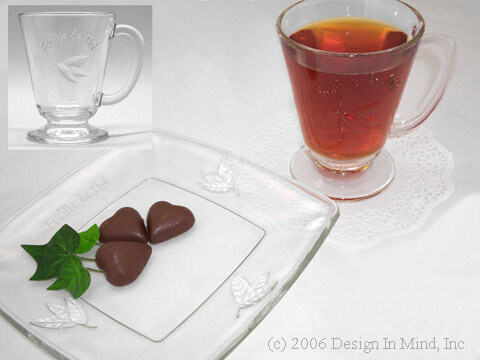 A classic glass pedestal mug and plate with embossed "feuille de the' (leaf of tea)". Mug holds 8 oz. Plate is 7 1/2" square. Made in France. Sold individually.